Rye Harbour Sailing Club holds an annual Rum Race, sponsored by Skipper Rum, on a Sunday as close to New Year’s Day as possible. Much depends on the tide which has to be at its high point late enough to allow other clubs to partake in this open event but not so late that darkness sweeps down on us. 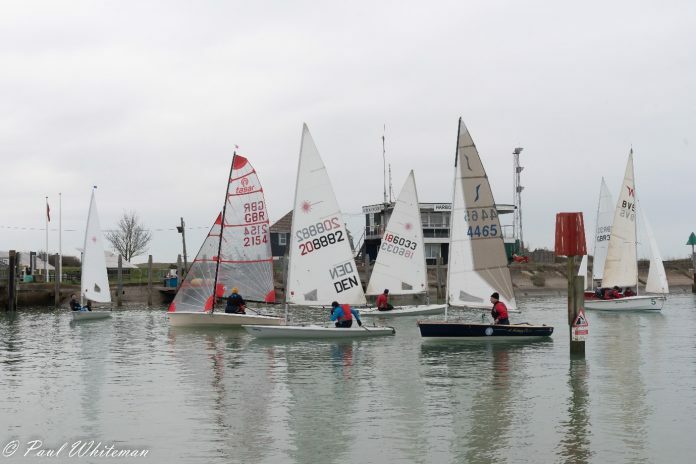 This year, 2019, the race was held on January 6 and for the second year formed part of the club’s Winter Series which attracts the more (fool)hardy sailors in the club. As the day of the race approached a degree of trepidation was apparent. Memories were resurfacing of last year’s race with its very high winds, multiple capsizes and the sight of zombie-like, cold, wet competitors shuffling out of the water pulling their dinghies behind them. Despite this we had 11 dinghies sailing including three old friends from Hastings and St Leonards Sailing Club. This year the winds were very light and coming from the north; resulting in a few relieved comments as boats were launched. The course saw competitors heading towards Rye up the River Rother before turning around and sailing out to Rye Bay and turning back again. The start line between the club and the Harbour-master’s office was filled with boats as they waited for the off. It would be an exaggeration to say that this was an exciting race for the spectators to watch; light winds never make for much of a spectacle but, as any sailor will tell you, getting the best out of a dinghy in light winds can be as challenging as coping with high winds. As the race went on the tide turned making beating into wind against the outgoing tide very difficult (and a timely reminder, if any were needed, of the utility of having a safety boat to hand). 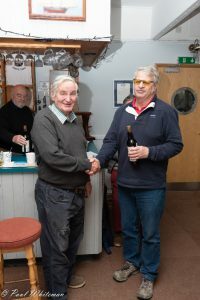 The race was won by Jim Taylor from Hastings and St Leonards Sailing Club, sailing a Taser Dinghy, with Jeremy Short coming second and Mark Whiteman third (both from Rye Harbour Sailing Club). After the race rolls and welcome mugs of hot soup were served, and prizes in the form of a bottle of Skipper Rum and a t-shirt were presented by Club President Carey Marsh. The club is very proud to congratulate Carey on the award of his BEM in the New Year Honours List for services to sailing and the people of Tenterden. Thanks go to Skipper Rum who sponsored the race and provided prizes; all those involved in the running of the race, the preparation of the food or running of the bar. Race entry fees of £110 were donated to Rye Harbour RNLI.